Background: Although guidelines for the diagnosis and management of asthma have been published over the last 15 years, there has been little focus on issues relating to asthma in childhood. Since the last revision of the 1999 Canadian asthma consensus report, important new studies, particularly in children, have highlighted the need to incorporate this new information into asthma guidelines. Objectives: To review the literature on asthma published between January 2000 and June 2003 and to evaluate the influence of new evidence on the recommendations made in the Canadian Asthma Consensus Report, 1999 and its 2001 update with a major focus on pediatric issues. Methods: Diagnosis of asthma in young children, prevention strategies, pharmacotherapy, inhalation devices, immunotherapy and asthma education were selected for review by small expert resource groups. In June 2003, the reviews were discussed at a meeting under the auspices of the Canadian Network For Asthma Care and the Canadian Thoracic Society. Data published up to December 2004 were subsequently reviewed by the individual expert resource groups. Results: This report evaluates early life prevention strategies and focuses on treatment of asthma in children. Emphasis is placed on the importance of an early diagnosis and prevention therapy, the benefits of additional therapy and the essential role of asthma education. Conclusion: We generally support previous recommendations and focus on new issues, particularly those relevant to children and their families. This guide for asthma management is based on the best available published data and the opinion of health care professionals including asthma experts and educators. Although Canadian guidelines for the diagnosis and management of asthma have been published over the last 15 years,1,2,3,4 there has been little focus on issues relevant to asthma in the young child or on prevention strategies. Since the last update of the Canadian guidelines in 2001,4 important issues and new studies focusing on asthma in early life have highlighted the need to incorporate this new information. Reports pertaining to a number of issues published between 2000 and June 2003 were reviewed initially by small expert resource groups. The results of these reviews were discussed by stakeholders during a 2-day consensus meeting, 27–28 June 2003. A working group with a pediatric focus met under the auspices of the Canadian Network For Asthma Care and an adult asthma group met under the auspices of the Canadian Thoracic Society. On the first day, these groups met separately to discuss specific issues related to pediatric and adult asthma and, on the second day, met jointly to discuss dissemination and implementation of the asthma guidelines. Data published up to December 2004 were subsequently reviewed by the individual expert resource groups. In the opinion of the expert resource groups and the writing committee, these were insufficient to warrant modifying the recommendations approved by the full consensus committee in 2003. The definition of asthma remains descriptive and has not changed since the 1999 Canadian asthma consensus guidelines.3 Asthma is characterized by paroxysmal or persistent symptoms, such as dyspnea, chest tightness, wheezing, sputum production and cough associated with variable airflow limitation and airway hyperresponsiveness to endogenous and exogenous stimuli. Inflammation and its resultant effects on airway structure are considered the main mechanisms leading to the development and persistence of asthma. Optimal management of asthma requires adequate evaluation of the patient and his or her environment. Asthma control should be assessed using specific criteria (Table 2). Asthma severity is more difficult to assess and may only be defined after asthma control is achieved. Asthma control should be assessed at each visit. If control is inadequate, the reasons should be identified and, if necessary, maintenance therapy should be modified (Fig. 1. Any new treatment should be considered a therapeutic trial and its effectiveness should be re-evaluated after 4–6 weeks. Fig. 1: Continuum of treatments for asthma management. Reprinted with permission from Elsevier (J Allergy Clin Immunol 2004;113:650-6). Inhaled corticosteroids (ICSs) should be introduced as initial maintenance treatment even when the patient reports symptoms fewer than 3 times a week. Although less effective than low-dose ICSs, leukotriene receptor antagonists (LTRAs) are an alternative for patients who cannot or will not use ICSs. If control is inadequate on low-dose ICSs, identify the reasons for poor control and, if indicated, consider additional therapy with long-acting β2-agonists, or LTRAs. Severe asthma may require additional treatment with systemic steroids. 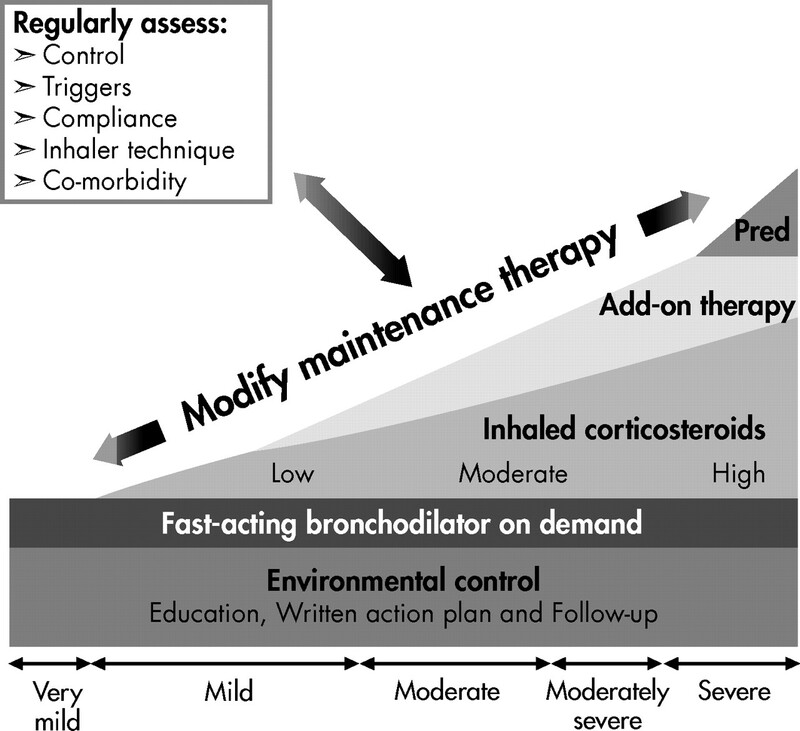 Asthma control and maintenance therapy must be assessed regularly. If good control has been sustained, consideration should be given to gradually reducing maintenance therapy, with regular reassessments to ensure that adequate control remains. This will allow determination of the minimum therapy needed to maintain acceptable asthma control. Asthma education is an essential component of asthma care. Poor asthma control is not usually due to a lack of efficacy of the medication, but is more often related to suboptimal use of medication or aggravating factors, comorbidities, poor inhaler technique, poor environmental control or a lack of continuity of care. Suboptimal use of asthma medication may be the result of inappropriate physician recommendation, poor adherence or both, perhaps as a result of undue fear of adverse effects of therapy. In the face of poor asthma control, it is crucial to identify and address the cause (Table 3). Sponsors: This is a joint report of the Canadian Network For Asthma Care and the Canadian Thoracic Society facilitated by unrestricted educational grants from ALTANA Pharma Inc, AstraZeneca Canada, GlaxoSmithKline Inc, Merck Frosst Inc and 3M Pharmaceuticals. Competing interests: None declared for Cathy Gillespie, Pierre Ernst, Estelle Simons and Barry Zimmerman. Allan Becker has received consultancy fees, speaker fees and/or grant support from all companies involved in asthma therapy in Canada. Denis Bérubé is on the advisory boards of ALTANA Pharma and GlaxoSmithKline; he has received speaker fees from ALTANA Pharma, AstraZeneca, GlaxoSmithKline, Merck Frosst and 3M Pharmaceutical and travel assistance from GlaxoSmithKline. Myrna Dolovich has received a grant from 3M Pharmaceutical and travel assistance from GlaxoSmithKline. Francine Ducharme has received speaker fees from Merck. Tony D'Urzo has received research, consultancy and speaker fees from GlaxoSmithKline, Sepracor, Schering-Plough, ALTANA Pharma, MethaPharma, AstraZeneca, ONO Pharma, Novartis and Kos Pharmaceuticals. Alexander Ferguson has received speaker fees from GlaxoSmithKline. Sandeep Kapur has received speaker fees from Merck Frosst and Schering and travel assistance from GlaxoSmithKline. Thomas Kovesi has received consultancy fees and travel assistance to attend meetings from Merck Sharp and Dohme and from ALTANA Canada, and he has received speaker fees from Merck Sharp and Dohme. Brian Lyttle has received honoraria from all the major pharmaceutical companies for dinner meetings regarding pediatric asthma. Bruce Mazer has received speaker fees from GlaxoSmithKline and Novartis. Mark Montgomery has received consultancy fees from GlaxoSmithKline (Regional Advisory Board) and ALTANA Pharma (National Pediatric Advisory Board); he has received speaker fees and educational grants from AstraZeneca, GlaxoSmithKline and Merck. John Joseph Reisman has received consultancy fees from Merck Canada (Respiratory Medical Advisory Committee) and has received speaker fees from GlaxoSmithKline and Merck Canada. Malcolm Sears has received consultancy and speaker fees from ALTANA Pharma, AstraZeneca, GlaxoSmithKline, Merck Frosst Canada and Merck Sharpe Dohme; he has received research grants from AstraZeneca and Merck Frosst Canada and travel assistance from AstraZeneca. Sheldon Spier has received speaker fees from AstraZeneca, Merck Frosst and 3M Pharmaceutical. Wade Watson has received honoraria from GlaxoSmithKline, AstraZeneca and Merck Frosst. At the time of going to press, none declared for Zave Chad, Soren Pedersen, Paul Pianosi and Robert Thivierge. Hargreave FE, Dolovich J, Newhouse MT. The assessment and treatment of asthma: a conference report. J Allergy Clin Immunol 1990;85(6):1098-111. Ernst P, Fitzgerald J, Spier S. Canadian Asthma Consensus Conference: summary of recommendations. Can Respir J 1996;3:89-100. Boulet LP, Becker A, Bérubé D, Beveridge R, Ernst P. Canadian asthma consensus report, 1999. CMAJ 1999;161(11 suppl):S1-62. Boulet LP, Bai T, Becker A, Bérubé D, Beveridge R, Bowie DM, et al. What is new since the last (1999) Canadian Asthma Consensus Guidelines? Can Respir J 2001;8(suppl A):5-27A. Steering committee on clinical practice guidelines for the care and treatment of breast cancer: a Canadian consensus document. CMAJ 1998;158(3 suppl):S1-2. Lemiere C, Bai T, Balter M, Bayliff C, Becker A, Boulet LP, et al. Adult asthma consensus guidelines update 2003. Can Respir J 2004;11(suppl A):9-18A.